Kerry had developed a new product and process which was proving difficult to characterise because of the nature of the product, which varied significantly in composition and rheology. The mixing of fluids is a science and although many fluids are often easy to model, this particular slurry created a problem with some of the material tending to float, some sinking and containing irregular solids which made it difficult to characterise. Kerry wanted a uniform distribution of the material throughout the suspension in the mixing vessel with consistent rolling movement on the top, bottom and sides of the tank. Inconsistency in the mixing process would mean areas of stagnation and accumulation of solids, which would affect process performance, cleanability of the vessel and product quality. Without any uniform flow patterns, the design of the mixing unit was impossible to model using traditional scientific methods. 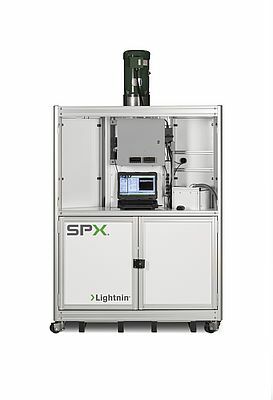 Through its Lightnin brand, SPX FLOW has a long history of mixing expertise across industries including food and beverage, personal care, chemicals, pharmaceuticals, water treatment and energy. Approaching any application, the question asked is not about which model of mixer is required, but what the customer wants the mixer to do. This is exactly the approach Kerry needed and, based on a long history of successful projects between the two companies, it approached SPX FLOW for help with its new process. 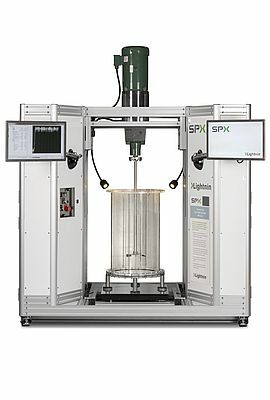 As the mixing requirement was a complex one and the irregular shape of the solid material meant they were difficult to incorporate uniformly into the slurry, SPX FLOW proposed the use of its portable LightninMiniLab™ test unit. This versatile test rig enables efficient trialling of different impeller mixer configurations and, as it is portable, it can be shipped to site and used with the actual process fluid. It has a Perspex tank, so the results of the mixing process can be quickly characterised and visualised. Test data is captured and video can easily be recorded so that the resulting motion and path of the fluid and results can be shared with wider stakeholders. The Lightnin- MiniLab test unit enables quick changes of impellers and tank baffles to see the effect on flow characteristics. Power, speed and torque data are captured for each test run. The unit also carries weighing scales, a hydrometer and a viscometer so that samples can be analysed. For Kerry, a series of nine tests were carried out over just a two-day period. A selection of baffle configurations, Lightnin A310/510 high efficiency hydrofoil and high solidity hydrofoil A320 impellers with a 90-litre vessel, to establish an efficient and effective configuration to meet its process needs. The test unit captures process data and enables characterisation of bulk fluids in the vessel to establish an accurate process viscosity. This means that, once the mixer configuration is determined, Kerry could be confident that the process results would be replicated at full production scale. “The LightninMiniLab has been used on a number of sites in Ireland since its introduction into Europe 3 years ago. The on-site mixing trials by MiniLab is in effect a front-end Mixing Process proving model which is directly scalable to plant production. The trials are invaluable in correctly selecting the most suitable agitator for the customers’ process. It really short cuts the time frame involved in selecting the equipment. For the end user the immediate visual impact of the trials takes the mystery out of mixing. The type of guarantee which comes with each MiniLab provides further comfort to the end user that the Lightnin mixing equipment will be effective.” Martin Kiely, Director, Glazik Mixing Solutions & Process Technologies distributor for SPX FLOW industrial mixers in Ireland. Being able to ship a flexible, reconfigurable mixing test unit to site has numerous advantages. It enables the easy use of actual process fluids and allows the customer to involve wider departmental stakeholders in establishing the right solution – something which would be more difficult if the customer had to travel to an offsite laboratory. For this project, the collaboration across different departments within Kerry Group and SPX FLOW application experts, meant the flow characteristics could be easily visualised and a way forward agreed in highly efficient timescales. The tests using the LightninMiniLab unit showed some surprising results. Although the process was a complex one, the solution required was simple. Initial presumptions were that baffles would help in this process, it transpired the best mixing results were achieved without baffles in the tank. As well as better fluid motion, the removal of the baffles gave Kerry the added benefits of reduced costs and, with a smoother mixer profile, enhanced cleanability for the system. Although higher power A320 impellers were trialled in the test process, because of the high calculated viscosity of the slurry, this viscosity level was not apparent at the impeller. Despite the large solids content of the suspension, the fluid behaved more like water. This reduced the power requirements from the initial estimates and resulted in a more efficient mixing solution. Another interesting result from the tests related to the flow profile at the bottom of the tank around the outlet valve. Although all other surface displayed good fluid motion, this showed an area of stagnation that was not desirable. For the full-scale production unit, however, the understanding gained from the tests and demonstration of the stagnation point enabled SPX FLOW to produce a custom impeller for use at the bottom of the tank to remove the dead area. Following the tests on site, a full-scale mixer was shipped to Kerry soon after the tests. The final mixer, designed for around 15,000 litres processing capacity, comprised a standard Series 10 mixer with three polished stainless steel A510 impellers and the single custom impeller at the bottom of the vessel.